A couple years ago I was in the University of Arizona bookstore browsing when I came across this book. I was immediately interested since it addresses one of my favorite topics—food and eating in China. I admit that I really enjoy eating when I am in China. In fact, I seldom (i.e. almost never) go out to eat Chinese food when I am in the States. I am too often disappointed with American style Chinese food. It’s not necessarily bad food, it’s just very different from authentic Chinese food that you get in China. Students often ask where the best Chinese restaurants are in town, and I have a hard time recommending anything. Usually the best Chinese food in town is made at the home of some Chinese family. Fortunately I am able to travel to China enough to satisfy my cravings for good, authentic Chinese food. I do cook Chinese at home on occasion to keep me happy between trips to China and have collected a few pretty decent Chinese cookbooks, some written in English from American Chinese writers and some in Chinese that I found in bookstores in China. Lin-Liu, Jen. 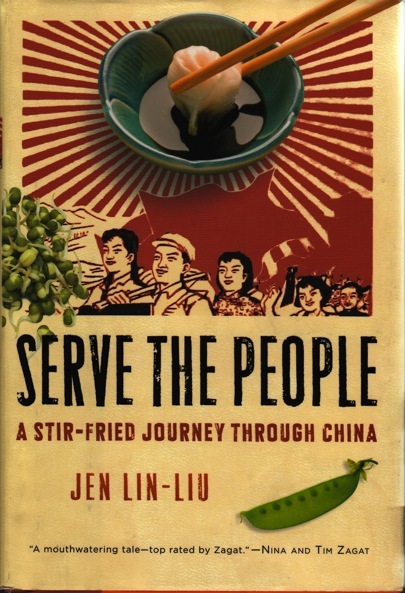 Serve the People: A Stir-Fried Journey Through China. Orlando: Harcourt, Inc. 2008. The author is a Chinese American journalist living in Beijing. It should be noted that she is a fluent speaker of Chinese and it would not have been possible to do the research that she did without good Chinese language skills. I mention this because I think it adds credibility to her research and what she has to say. To be able to interview and interact with people without an interpreter I think is very valuable and will allow one to get stories that would otherwise be unlikely, if not impossible. The title of the book comes from the socialist slogan coined by Mao Zedong and popularized by the communist party: 为人民服务 weì rénmín fúwù, which literally means “for people serve.” When I first arrived in China in the early eighties you could find lapel pins all over the place with this slogan. Though it is used less these days, you still hear it once in awhile, probably more in official settings. This book is divided into four parts, 1) Cooking School, 2) Noodle Intern, 3) Fine Dining, and 4) Hutong Cooking. In the first part Lin-Liu describes her experience as a student in the Hualian Cooking School in Beijing, a three month course, Monday through Friday for two hours a day. At the end of the course students take a national cooking exam, are awarded a diploma and can then be hired to work as a cook in a restaurant. This does not mean that you have to have a cooking diploma to work in a restaurant, as I am sure there are countless small mom and pop restaurants all over China where they have received no formal training. The author learns all about Chinese regional cuisines, different kinds of foods, methods of preparation, and so on. She also gives the reader some insight into attitudes and practices of traditional Chinese education. For example, she learned very early in the course, “listen, bow, and copy” and don’t ask questions. In the second part of the book, Lin-Liu apprentices with a noodle chef from Shanxi Province. She works in his tiny noodle stall in a warehouse district in Southeastern Beijing. Through much hard work she learns how to prepare a variety of different kinds of noodles. I think her goal here was not just to learn how to prepare and cook noodle dishes, but also to experience working in this very vibrant and important part of the Chinese restaurant culture, the food stall, which is really the equivalent of fast food in China. In Part Three she moves to Shanghai and works in a high end Shanhaiese restaurant on the Bund called The Whampoa Club. Here she learns all about the opposite end of Chinese restaurant culture. The reader gets a glimpse into the high fashion world of Shanghai and the exquisite food that is prepared and consumed by the wealthy, both Chinese and foreigners. It is a completely different world from the noodle shop and yet many of the techniques used are the same. The book ends with a rather short section on Hutong cooking. 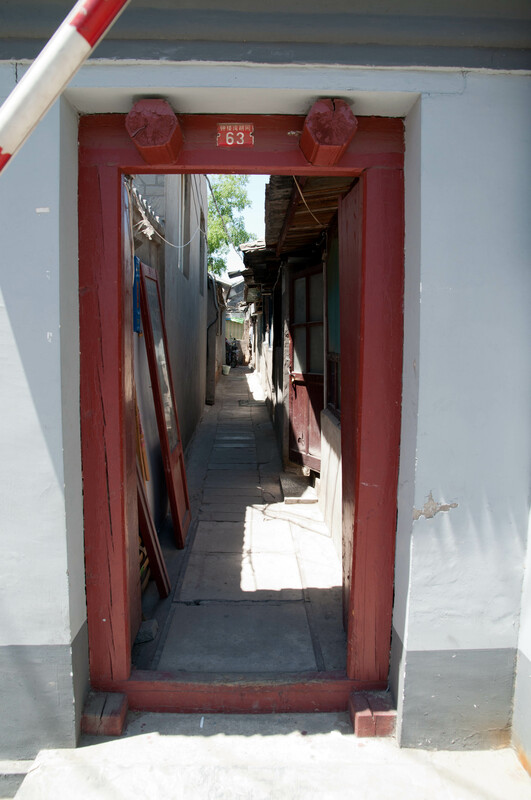 A 胡同 hútòng is an alley or lane and is used to identify many of the old Beijing neighborhoods characterized by courtyard houses and mazes of narrow lanes. Unfortunately these historic neighborhoods, which have been around for hundreds of years, are disappearing to new develpment. This part of the book is mostly about these historic neighborhoods and the people that live in them. 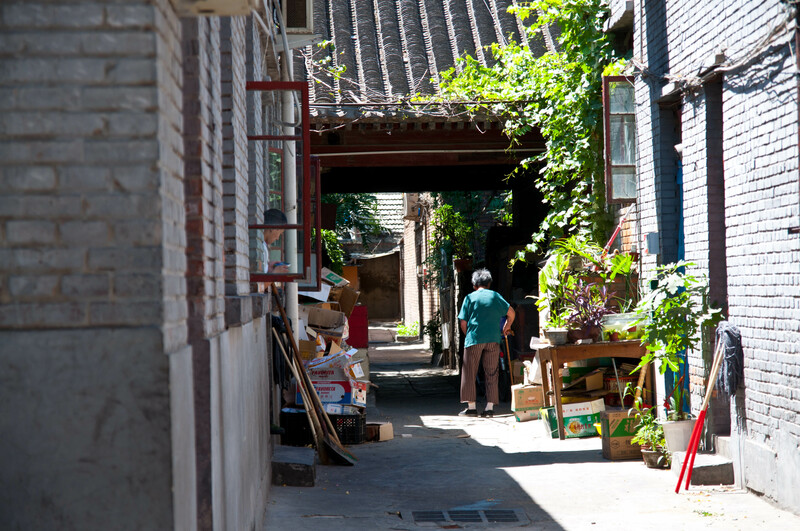 She also discusses how these friends of hers shop and cook in their small hutong flats. It is an interesting look into these very cool neighborhoods. A couple years ago a friend an I spent a very enjoyable day wandering a hutong neighborhood admiring the architecture, eating at a small restaurant, and chatting with people. I really enjoyed this book. Lin-Liu did an excellent job drawing the reader into the world of Chinese food and eating. The book is sprinkled with historical anecdotes and interesting facts, such as how MSG is made and used in Chinese cooking. The reader also sees an intimate portrait of regular Chinese people living ordinary lives in Beijing. Again this would not have been possible without Chinese language skills. I guess my bias as a Chinese language teacher is showing through here, but it goes without saying that learning a foreign language opens all kinds of doors not available to those without foreign language skills. For example, who is going to invite a foreigner to their home if they cannot communicate with them? I highly recommend this book as a glimpse into contemporary China, particularly with regard to food and eating, which of course, is everything in China. Students frequently ask for recommendations on good books about China. Of course this is a wide open field which includes everything from books on Tang Dynasty poetry and history books, to reportage on current events in China, and everything in between. There is literally a landslide of books being published these days on all topics related to China. Occasionally I will post book reviews of books I feel are worthwhile reads. I won’t waste anyone’s time reviewing books I don’t recommend. So if I post a review here, I think it is worth reading. If you have heard of a book and would like to know what I think, send me an email, or post a comment. If I haven’t read the book and it looks interesting I may read it and post a review. China: Alive in the Bitter Sea by Fox Butterfield (1982, updated in 1990). China Wakes: The Stuggle for the Soul of a Rising Power by Nicholas Kristoff and Sheryl Wudunn (1994). Red China Blues by Jan Wong (1996). The Chinese by Jasper Becker (2000). Chinese Lessons: Five Classmates and the Story of the New China by John Pomfret (2006). Gifford, Rob. 2007. China Road: A Journey into the Future of a Rising Power. New York: Random House. 304 pages. $17.00. I was pulled into this book almost immediately and enjoyed the stories. 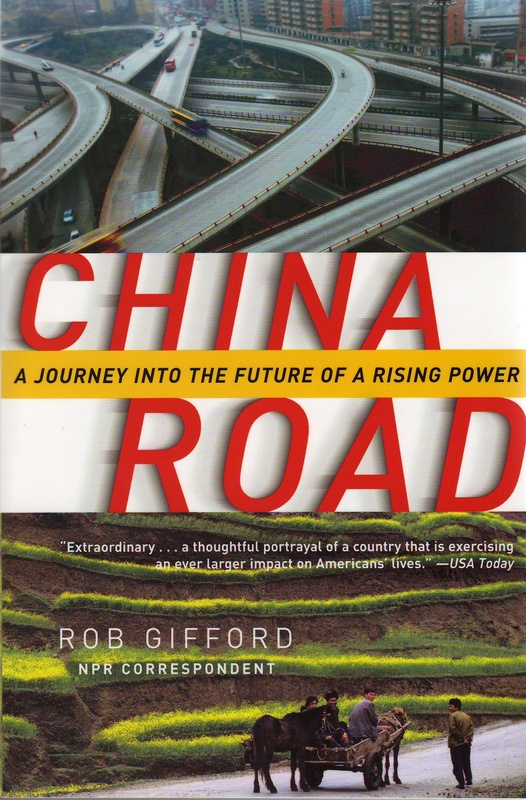 Rob Gifford was the Beijing correspondent for NPR for six years. He knows China and speaks Chinese. I mention this because most of his stories would not be possible if he could not communicate with the people he encounters along his journey. The book chronicles his trip (actually a couple trips) along the entire length of State Route 312 from Shanghai to the border of Xinjiang and Kazakhstan. He travels by taxi, public bus, hitches rides with truckers, and occasionally rides in a private car. His purpose is two-fold: one, to meet common people along the way, particularly those that live in out of the way places, and two, to explore the impact this modern highway has had on the development and modernization of the regions in which it passes. I especially liked his stories about meeting common everyday folks, like long haul truckers. It is always interesting to see how “normal” people live. His stories bring out the warmth and sometimes complexity of common Chinese people. He describes the people, the harsh landscape of Western China, and the small towns along the way. Some of the towns have prospered with the coming of the highway, and some towns not directly on the route have languished. Overall, I highly recommend the book. Gifford is personable and knowledgeable without being pretentious. Hessler, Peter. 2010. Country Driving: A Chinese Road Trip. New York: Harper Perennial. 424 pages. $15.99. I expected this book to be similar—an account of a Chinese road trip. This was only partially true. His approach in this book is to look closely at three different areas of China and how the increase in drivers and the mobility that it has afforded have influenced these areas. The book is divided into three distinct, unrelated sections: “The Wall”, “The Village”, and “The Factory”. Each of these sections could be read independently. It is almost like three books or stories in one. In “The Wall” he describes his adventures driving the entire length of the Great Wall, from the ocean in the East to deep into Xinjiang and Qinghai Provinces. This constitutes several individual trips in rented cars. Along the way he visits many small towns along the ancient Great Wall. Like Gifford, Hessler speaks Chinese having been a long-term resident of Beijing as a correspondent for The New Yorker. His ability to speak Chinese allows him to interact on a close personal level with many regular Chinese people who live off the beaten track. Many of the individuals and towns that he describes in this section of the book seem to have been left behind the rapid modernization and development in the more populated areas of China. In fact, in almost every small town he encounters he rarely finds young people. They have all left the small towns to find work in the cities. This work ranges from working in factories to beauty parlors. In these forgotten small towns he only finds the very old and the very young. In the next section of the book, Hessler finds a small village on the Northern outskirts of Beijing and rents a farmers house. He befriends a family in the village and recounts his rather intimate interactions with them over the course of several years. He discusses the development and modernization efforts in this small village (less than 300 individuals) and how that impacts this family and their neighbors. Among other things, he discusses the Chinese education system, the world of small, private businesses in China, the health care system, Chinese tourism, real estate and development, and so on. Through Hessler’s eye for detail the reader really gets to know this peasant family, their joys, struggles, and triumphs. 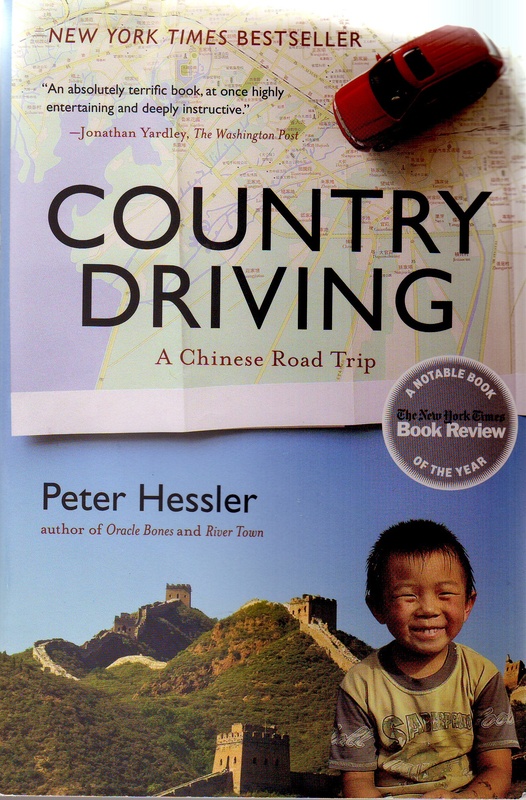 The last section describes Hessler’s many trips to Zhejiang Province and the factory towns springing up along a new highway. He meets two enterprising men who open a factory that makes the tiny fabric covered metal rings used in brassieres. He describes in detail how these men start and run their business, from building and outfitting the factory to hiring employees. Along the way we meet a migrant family that work in the factory. There are huge numbers of migrant workers in the factory regions of China’s East. Hessler helps the reader understand how this huge migration of people is impacting China, on the larger scale as well as at the individual level. I enjoyed this book for the intimate portrayals of individuals living on the edges of society—particularly peasants and migrant workers. It is not easy to have access to these classes of people in China. Undoubtedly, Hessler would never have been able to approach and get close to these people without a sound understanding of Chinese behavioral culture and good facility with the language. I admire him for being able to do that. I think this book is much stronger that his previous book, Oracle Bones. I felt that book wandered and lacked focus. Though interesting in parts, I found it more difficult to follow the multitude of overlapping and sometimes unrelated stories. Both of these books provide the reader with an intimate, personal look at regular people living all over China. This is where their strengths lie.